Well this was a nice thing to wake up to. I can't wait to see more pixel jams in the future and what cool pixel art comes out of them! Congrats to Artcanary and Tomix!!! I didn't win, but to be honest, I am not sad at all, I was doing it mostly for the sake of practice and develop a skill so I am glad to have my first pixel jam. I saw the critiques Aki made so I think I'll take some time to use them and finish my sprite. Regardless, congrats to everyone who joined in! 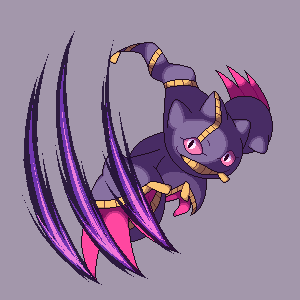 Mega Banette uses Shadow Claw! 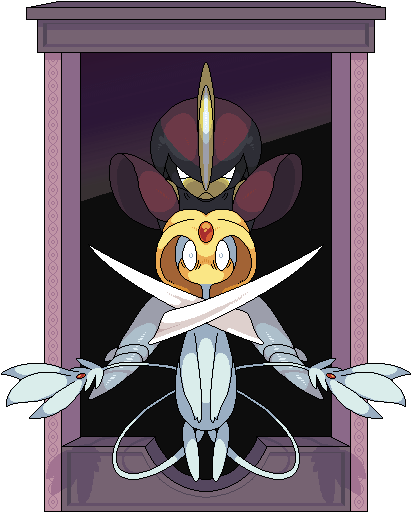 Or just Bisharp using Guillotine against Uxie. hi!! 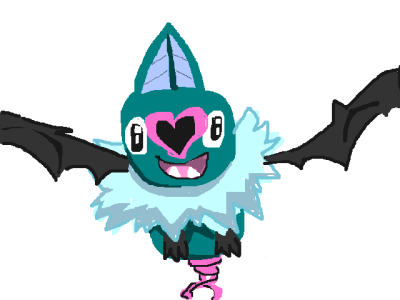 so I just wanna make sure im not accidentally breaking the rules, am I allowed to enter pixel art that i made during the jam but it was based on a drawing i did before the jam then added a pokemon move to? The art is based on was also made by tou so there's no problem there...So long as the pixel art version wasn't started before the contest, then you're good! When you're ready, go ahead and make it an official entry by posting in the ongoing event thread. Today is the last day for submissions! I pretty much allways get goof it up because I'm making and/or playing video games and then totally forget and go to bed and don't close the thread untill morning if anytime I forget to close the thread on time that's entirely on me and it's your free time gain. Hey Marina and Stripes, thanks for trying to enter the Jam this time and I'm sorry there were deadline issues. If something like this comes up again, just shoot me a DM and I'll hold of on judging/extend the deadline for a couple hours no problem. I'm completely willing to extend the deadline if anyone needs just a little more time to finish up! You just gotta let me know! Congrats on the winners! Those pixel artworks are some of the best I've ever seen! As for myself, thanks Aki, for having this Slam Jam, where I took my spriting skills out for a spin for the first second time ever. It was really fun trying to do a Z-move with Infernape. The feedback you gave was pretty good too (in my defense, the whole thing was pixel art, but I guess using the gradient fill in Photoshop make it look less pixel-ly, eh?). I might edit my Infernape to make it super clean and upload it here on Relic Castle again maybe . Congrats to @Clifford and @Cilerba for getting those badges! As for my feedback, thanks Aki! I know my pixel art isn't that great but I'm still pretty proud of it. (I made my logo) I hope that I'll get better with time and I hope that will show in later Pixel Slams.